ASTRALIS, with its extremely high level of technical sophistication is highlighted by a legendary mechanism stemming from an authentic passion for fine watchmaking. ASTRALIS,the brand new timepiece from Louis Moinet, features an exclusive and unprecedented alliance of complications: an astral Tourbillon, a split-second column-wheel Chronograph, as well as a 24-hour Planetarium displaying four meteorites boasting unique rarity. The sheer complexity of ASTRALIS necessarily implies restricted production.Louis Moinet will produce ASTRALIS in a limited edition of 12 watches, each of which calls for extreme attention. The ASTRALIS features an exceptional case is crafted in the warm shades of 18-carat rose gold 5N, and its polished finish lends it a distinctive glow. This highly complex case involves the manufacture of 50 different elements that are then meticulously assembled. The technical feats involved include the unique interchangeable crown tube system for which an invention patent has been filed. In order to ensure the purest possible design, ASTRALIS features an ergonomic approach to the split-second function which is integrated within the crown, while the bezel secured with six screws radiates a strong presence and facets that are softened by the work of the master polisher. ASTRALIS comprises the distinctive characteristics of the Louis Moinet universe: the dial with its dedicated “Côtes du Jura”® motif, the “Gouttes de Rosée” (“dewdrop”) hands, and the brand’s signature case structure. It also features some subtle philosophical nods such as the split-second hand adorned with a shooting star, or the pushers adorned with a wind rose. ASTRALIS is fitted with a hand-sewn strap in Louisiana alligator leather lined with crocodile leather to ensure a perfectly comfortable feel on the wrist. The double folding clasp is made from 18-carat rose gold and grade 5 titanium with a PVD finish. It is delivered in the famous Louis Moinet presentation box evoking the Traité d’Horlogerie (watchmaking treatise) written by the master-watchmaker in 1848, and which remains an enduring reference work in the field of horology. The entire escapement is mounted on a mobile carriage, thereby cancelling out the effects of gravity and enhancing rating precision. The plate is made from aventurine, finely chased and measuring a mere 0.03 millimetres thick – a major technical feat in itself. Aventurine perfectly evokes a star-studded sky and thus creates a delightful stellar backdrop for the technical nature of the tourbillon. Inside the mobile carriage, the balance-and-spring assembly, lever-wheel and lever perform a full turn every 60 seconds. 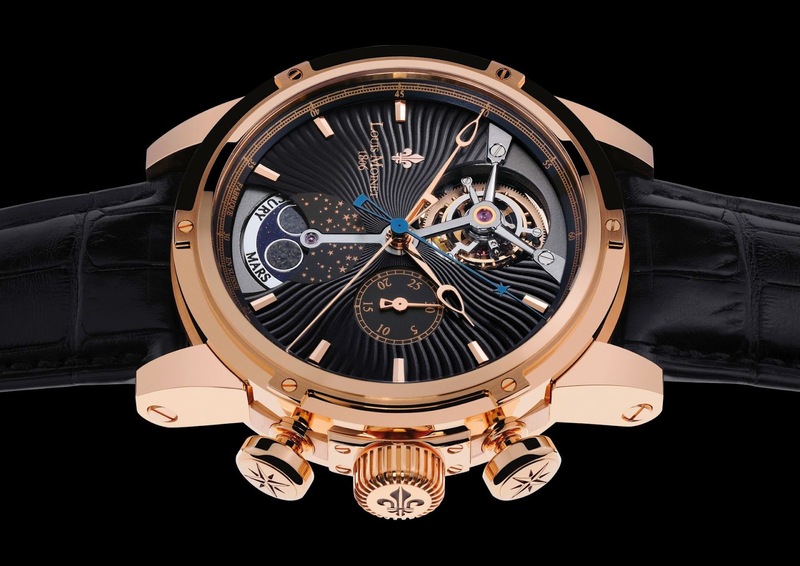 And finally, ASTRALIS intensifies the magic of the tourbillon by connecting its carriage to the planetarium via a vertical bar that is manually bevelled, drawn, and adorned with a jewel on both ends. 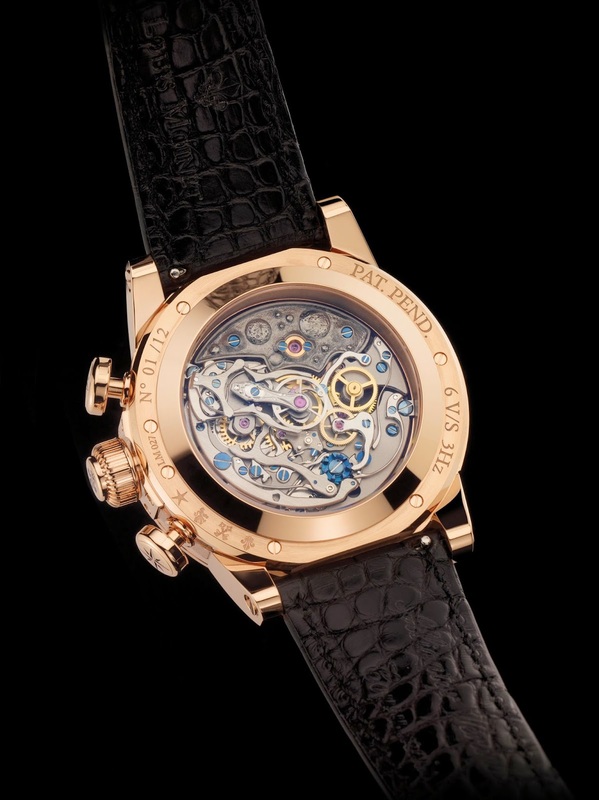 The spectacular split-second mechanism is highlighted in an original way. The column wheel is made in blued steel, and the famous split-second clamps are made all of a piece. The rattrapante bridge is hand-engraved with a “shooting star” motif. Entirely redeveloped on the basis of an historical Venus calibre, the LM27 movement is a blend of sophisticated technology and aesthetic charm. The finest artisans have used modern methods of accentuating its beauty. The gilded wheels and jewel sinks, as well as the blued steel screws highlight the strong character of this finely crafted movement. 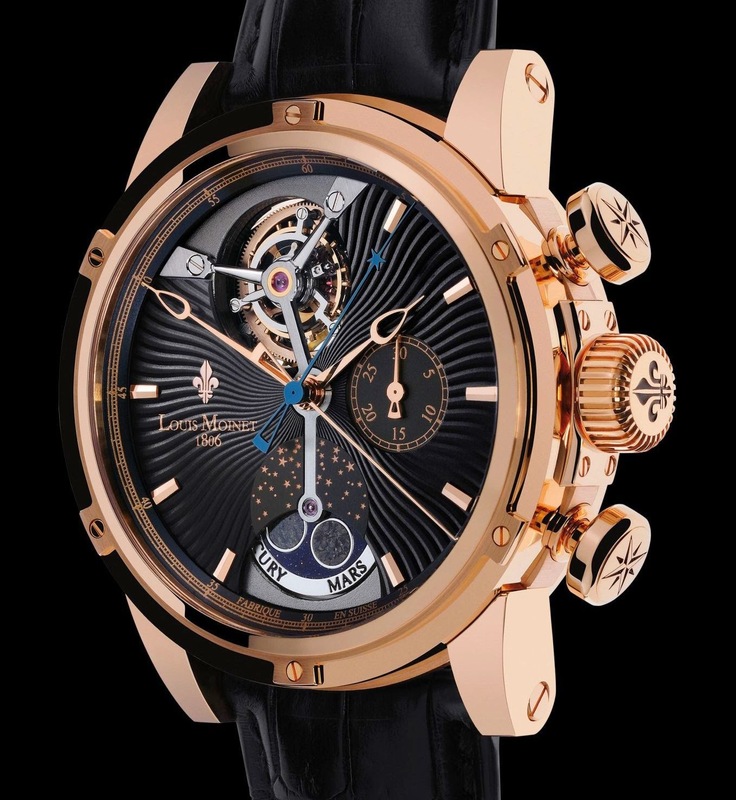 The tourbillon bridge is embellished with a hand engraving evoking the cosmos in a fascinating artistic manner. Above and beyond the technical accomplishment, it reflects a determination to achieve aesthetic harmony and which propels ASTRALIS to the very forefront of the watchmaking scene. 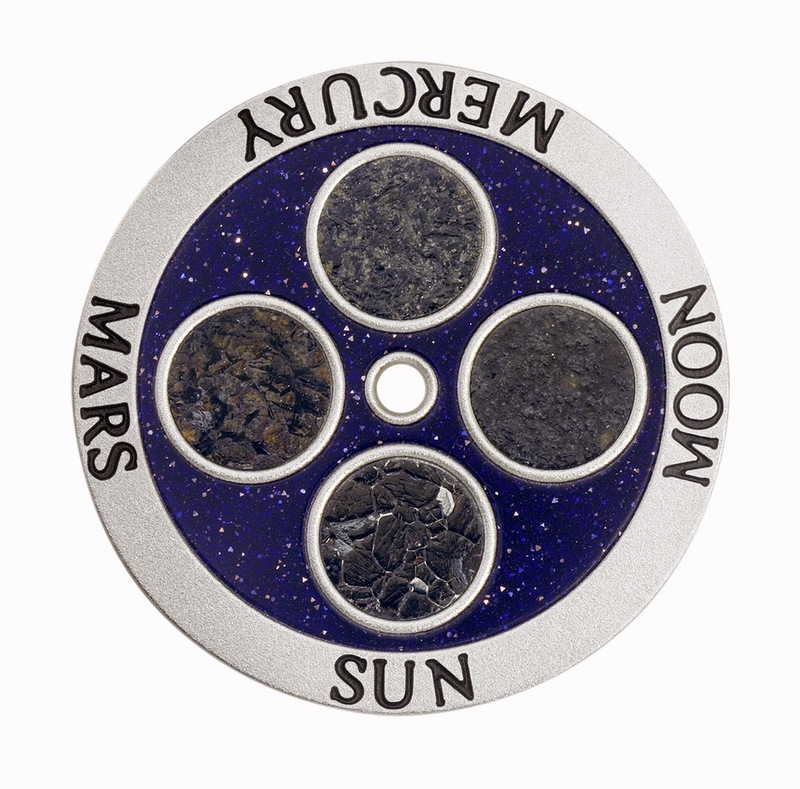 This mechanism revolves once a day and successively displays four planets, embodied by fabulous meteorites. Mars: Louis Moinet is the first and only watch brand to present an authentic meteorite originating from the planet Mars. This is doubtless because of its extreme rarity. To date, less than 75 Martian meteorites have been authenticated as such by scientific institutes worldwide. The price per gram of a Martian meteorite is far higher than that of gold, platinum and diamond combined. The Jiddat al Harasis 479 Martian meteorite covered a distance of more than 55 million kilometres before ASTRALIS invited it to embark upon a new journey through space and time. Mercury: Mercury is embodied by what is doubtless the world’s most precious meteorite: Sahara 99555. This is indeed the most ancient known rock in the entire solar system. Its age is estimated at 4,566,200,000 years (4 billion 566 million years), with a 100,000-year precision margin. Since it is “the original stone”, scientists have christened it the “Rosetta stone”. This meteorite may well have come from the planet Mercury, although this cannot be asserted for certain, since there is as yet no means of geological analysis available for Mercury. The Sun: The sun is depicted by the extremely beautiful Itqiy meteorite, an asteroid that formed near the sun. Itqiy has provided valuable scientific indications on the formation of the solar system, despite the fact that its own origin remains a mystery. 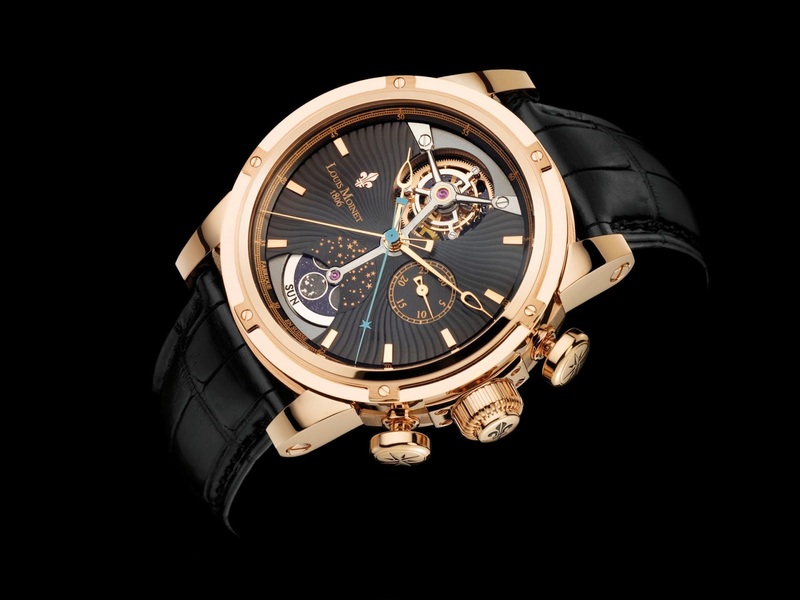 The Moon: Louis Moinet has played a pioneering role as the only watch brand to use a lunar meteorite (Dhofar 459). To date, less than 100 lunar meteorites have been identified worldwide. Most are exhibited in museums, which means only a very few are available to the public at large. These meteorites are thus extremely rare and are intended for the most discerning collectors.